Aurifil Cotton Mako thread is made using the best long staple Egyptian cotton making it strong, smooth and relatively fuzz free. 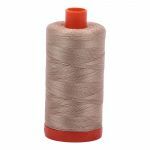 The long fibres, and the mercerising treatment used during manufacturing, produces a thread with a high sheen and superior strength. This fine, but strong, thread produces a subtle effect when used for machine quilting. It is possible to achieve very detailed quilting without an unsightly build up of thread on the quilt. It is a great alternative to silk thread for hand appliqu as cotton Mako Ne50 beds down into the background for an invisible finish. Machine appliqu will have a fine delicate finish without the bulky finish of some heavier threads. Ideal for miniature machine piecing, it makes a neat flat, accurate seam with precise points and less bulk. 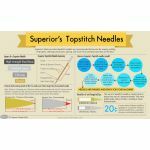 When used for foundation & paper piecing choose a slightly smaller stitch than you would use for general piecing and you will find that the papers will tear away with ease. 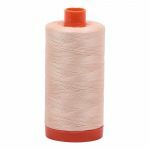 Recommended for use in the bobbin when machine quilting with any slippery decorative threads.